Details have just surfaced for Brooklyn Vegan’s Saturday Hotel Vegan event, featuring Heartless Bastards, Lucero, Action Bronson & more. 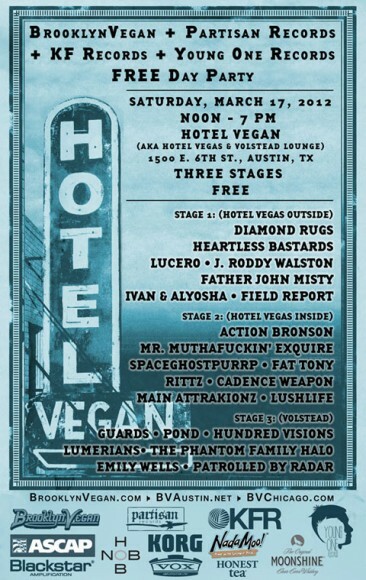 Like all events occurring at Hotel Vegan during SXSW 2012, Saturday will be a completely free event with no RSVP or badge requirement. Details after the jump. BrooklynVegan is partnering with Partisan Records, KF Records and Young One Records to put on this awesome event. Aside from the music, BrooklynVegan has gone all out to make this event even more appealing to the SXSW 2012 crowd. Expect complimentary drinks, along with vegan treats. They’ve even made a Spotify playlist for the event! The full lineup is included below.